** TOGETHER LET’S CAN CANCER! Money raised helps provide treatment and research at the Lafayette Family Cancer Center. Redeemables can be dropped off at 83 Main Road North; Hampden, Maine 04444. So far we’ve raised over $20,000 – thank you for your help! ** Many of our hotels have ongoing sales (bottled water, stuffed animals, and more). Please check with individual properties to see what they are offering. Thank you for your support! This year the Lafayette Hotels team had over 125 members and raised over $75,000 – Thank you so much for your support! Brewer, Maine at the Lafayette Family Cancer Center You can walk, run, cycle, ride, or volunteer. You can even participate virtually from afar, or be a lawn-chair participant! 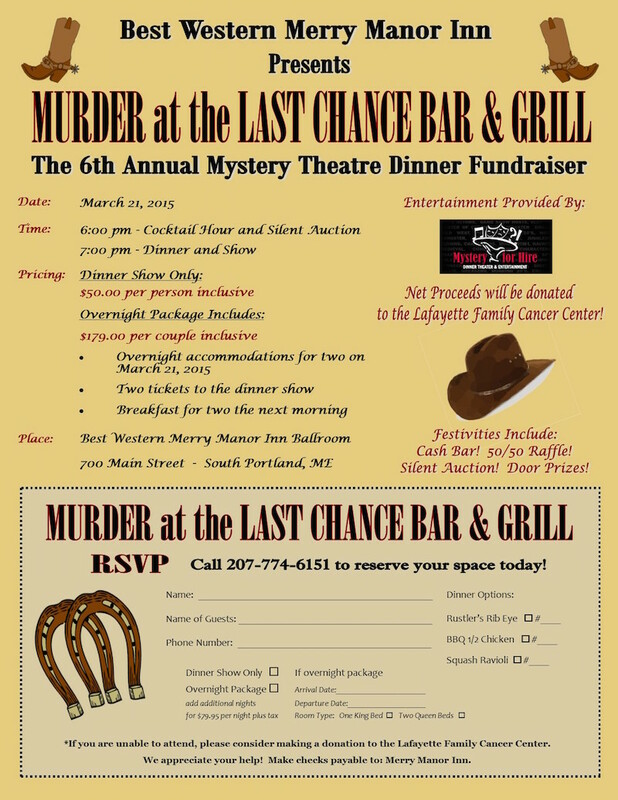 “Murder at the Last Chance Bar & Grill” the 6th Annual Mystery Theatre Dinner Fundraiser at the Best Western Merry Manor Inn. 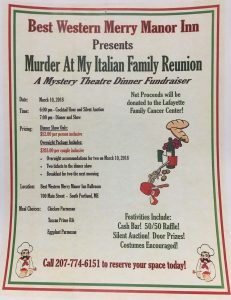 Event includes: cocktail hour, silent auction, 50/50 raffle, door prizes, dinner and of course the mystery show! Net proceeds benefit the Lafayette Family Cancer Center. Call 207-774-6151 to reserve your space today. Download the flyer here. There is a place for everyone in the EMMC Champion the Cure Challenge! You can walk, run, cycle, ride, or volunteer. You can even participate virtually from afar, or be a lawn-chair participant. 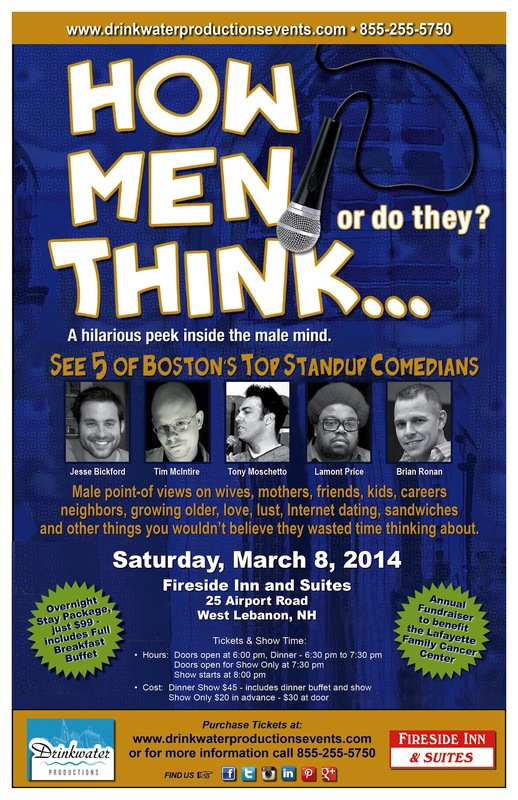 Comedy Show: “How Men Think… or do they?” 5 of Boston’s Top Standup Comedians gave a hilarious peek inside the male mind. Proceeds benefited the Lafayette Family Cancer Center. For more information, please download the flyer here. The Champion the Cure Challenge was held at the Lafayette Family Cancer Center in Brewer, Maine. Visit the Lafayette Hotel’s Team Page Here. The 5th Annual Cancer Research Culinary Event was held in Bar Harbor at the Looking Glass Restaurant. Once again, Executive Chef Arturo Montes of the Looking Glass Restaurant and Executive Chef & Owner Frank McClelland from L’Espalier Restaurant in Boston created a stunning meal and the event raised over $10,000! The Tugboat Inn in Boothbay Harbor raised money for the Lafayette Family Cancer Center with Darling’s Ice Cream for a Cause. – Find out more at the Boothbay Register. 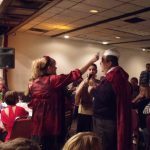 The Best Western Merry Manor Inn hosted their 4th Annual Murder Mystery Dinner Theatre – “Lights! Camera! Murder!” on Saturday, March 16th at 6:00pm. Download the flyer here. August 18, 2012 The Champion the Cure Challenge was held in Brewer, Maine. The first two years of the event have raised over $325,000 for EMMC’s CancerCare of Maine – this year’s event alone raised over $320,000 – making the three-year total over $645,000! August 19, 2012 – The 4th Annual Cancer Research Culinary Event was held in Bar Harbor, Maine on Sunday, August 19. Executive Chef Arturo Montes of the Looking Glass Restaurant at the Bluenose Inn, welcomed special guest, Executive Chef & Owner Frank McClelland from L’Espalier Restaurant in Boston. The event raised over $13,000 for EMMC’s CancerCare of Maine at the Lafayette Family Cancer Center. 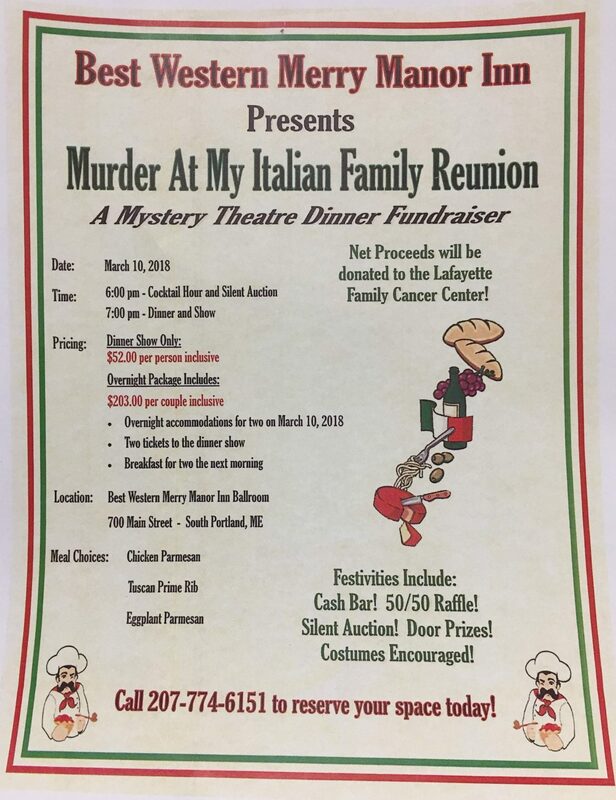 The BEST WESTERN Merry Manor Inn is hosting a mystery dinner fundraiser with proceeds to benefit the Lafayette Family Foundation. The dinner event will start at 6:00pm with a reception and the dinner and show start at 7:00pm. The Third Annual Cancer Research dining was held in Bar Harbor, Maine on Sunday, August 21, 2011. It was an amazing meal, silent auction, and more. Executive Chef Arturo Montes of the Looking Glass Restaurant at the Bluenose Inn and special guest, Executive Chef Jonathan Cartwright from the White Barn Inn Restaurant served up and unforgettable lunch! Thanks to all who participated. The event raised over $12,000 for EMMC CancerCare of Maine. The Second Annual Champion the Cure Challenge will be held in Brewer, Maine on Saturday, August 20, 2011. Find out more at the Champion the Cure Challenge page. The event was a great success and raised over $220,000 for the EMMC CancerCare of Maine at the Lafayette Family Cancer Center – thank you to everyone who supported, walked, ran, biked, volunteered and more! Logan Lafayette held a yard sale this Saturday, June 11th. He raised $425 to be donated to Cancer Care of Maine to benefit the Lafayette Family Cancer Center in Brewer, Maine. 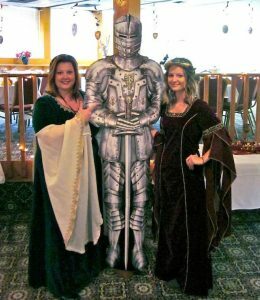 On Saturday, February 12, the Best Western Merry Manor Inn hosted the Spirit of Suspicion Mystery Dinner Theater to benefit the Lafayette Family Cancer Center. In addition to the dinner and show, they held a silent auction. Individual Lafayette Hotels and local businesses were very generous in their donations. The event raised $4,700 for the Cancer Center. We would like to thank the Mystery for Hire who put on a great production. Sponsors included: GOLD: Berry, Dunn, McNeil & Parker; and Daigle Commercial Group. SILVER: Maine Paper; Paragon Commercial Realty; and Governor’s Restaurant. FRIENDS: Big Red Quickprint; Nelson and Small; and Dan Marois. Thank you to all sponsors, participants, attendees and volunteers who made this event a success! Executive Chef Arturo Montes of the Looking Glass Restaurant at the Bluenose Inn special guest, Frank McClelland, owner and Executive Chef of L’Espalier Restaurant, joined together for this amazing evening. The event raised $10,000! The Fireside Inn & Suites in West Lebanon hosted a book and bake sale, barbeque, live music and much more. The first annual Champion the Cure Challenge was held to benefit cancer research at Eastern Maine Medical Center’s CancerCare of Maine located in the Lafayette Family Cancer Center in Brewer. The Best Western, White House Inn was a proud sponsor of the event. The event had been in place under the name Run for Hope for the past fifteen years, hosted by the Best Western, White House Inn. We are most honored to continue the legacy of The Run for Hope. Find out more at the Champion the Cure Challenge page. Nancy Cayford held her second annual benefit yard sale fundraiser for the Lafayette Family Foundation and Lafayette Family Cancer Center. This event raised $2,300 – congrats Nancy! The Tugboat Inn in Boothbay Harbor held a special fundraiser to support the Lafayette Family Foundation and cancer research in Maine. Kay Brown, Danny Beal and the Holy Mackerels played on the Marina Deck at the Inn. Their wonderful musicians and staff are donated their time to the event. The event raised $1,253.25. On Saturday, April 24, Paul Prior held a gallery showing and sale of his photographs. 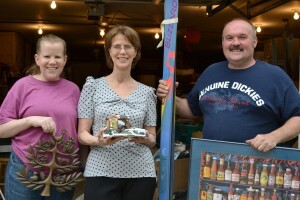 50% of the proceeds from the sale were donated to the Lafayette Family Cancer Center. The show raised $750 for the Cancer Center. See Paul’s work at his photo gallery here. Held on Friday, March 26, from 6pm to 9pm, David from “Reiki-Fire” and Brenda from “Soundings” hosted a guided journey with emphasis on healing through sound. The evening was full of love, laughter and healing featuring the vibrations from Quartz Crystal Singing Bowls. The event raised $1,430 for the Lafayette Family Cancer Center. 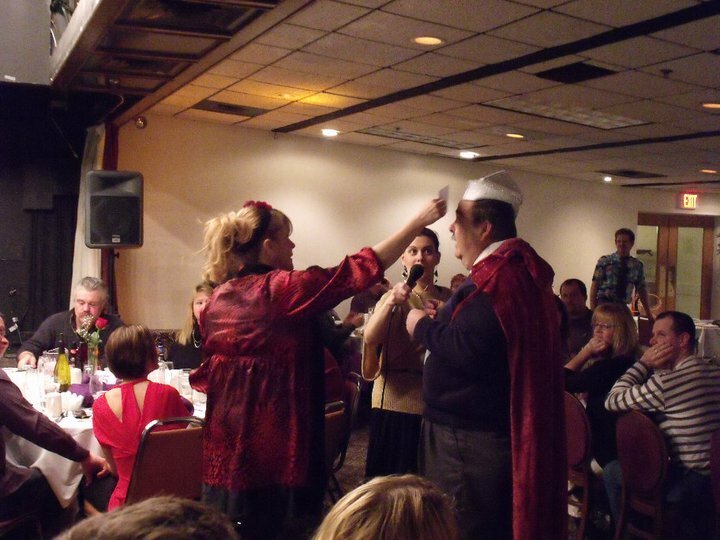 On Saturday, February 13, the Best Western Merry Manor Inn hosted the Holy Moly Matrimony Mystery Dinner Theater to benefit the Lafayette Family Cancer Center. In addition to the dinner and show, they held a silent auction. Individual Lafayette Hotels and local businesses were very generous in their donations. The event raised $4,000 for the Cancer Center. We would like to thank the Mystery for Hire who put on their 438th dinner production. Sponsors included: Portland Discovery Land and Sea Tours, Berry Dunn McNeil and Parker, New England Coffee and Governor’s Restaurant.